Marie Adrienne Françoise de Noailles, Marquise de La Fayette (2 November 1759 – 24 December 1807), was a French marchioness. She was the daughter of Jean de Noailles and Henriette Anne Louise d'Aguesseau, and married Gilbert du Motier, Marquis de Lafayette. They had four children: Henriette (1776–1778), Anastasie Louise Pauline du Motier (1777–1863), Georges Washington Louis Gilbert du Motier, (1779–1849), and Marie Antoinette Virginie du Motier (1782–1849) She was a great-granddaughter of Françoise Charlotte d'Aubigné, niece of Madame de Maintenon. Adrienne was born and bred in the Hôtel de Noailles, the family residence in Paris, where was also celebrated, on 11 April 1774, her arranged marriage with Gilbert du Motier, marquis de Lafayette. The orphan Lafayette had inherited large estates that yielded an annual income of 150,000 livres ($1.5 million). Her mother, concerned with their youth, kept them apart for a year while she managed their courtship. In 1776, the young couple had a daughter, Henriette. Lafayette went to visit his uncle, Emmanuel Marie Louis de Noailles, Ambassador to England. During a ball at Lord George Germain's, he met Lord Rawdon, met Sir Henry Clinton at the Opera, and met Lord Shelburne for breakfast. He left to return to France, and then America. 7 June You will admit, dear heart, that the occupation and the life I am to have are very different from those which were in store for me in the futile journey to Italy. Defender of that liberty that I idolize, coming myself freer than anyone else to offer the services of a friend to that interesting republic, I bear with me only my sincerity and my good will; no ambition, no personal interest. In laboring for my own glory, I labor for the prosperous issue of their efforts. I hope on my account you will become a good American. It is a sentiment suited to virtuous hearts. The welfare of America is bound closely to the welfare of all humanity. She is to become the honored and safe asylum of liberty! Adieu! Darkness does not suffer me to continue longer. But if my fingers were to follow my heart, I should need no daylight to tell you how I suffer far away from you, and how I love you. Adrienne was to have four children in total, amongst whom (b. 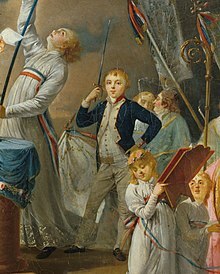 1779) Georges Washington de La Fayette was eldest son. The eldest child, Henriette died aged 22 months. I wish, to make my obeisance to the wife of the hero of the New World. May I live long enough to salute in him the liberator of the Old. From July 1779 to March 1780, Lafayette returned to France to present a plan for French support of the Americans. An army was dispatched under the comte de Rochambeau. Lafayette drew 120,000 livres, and gave Adrienne power of attorney. On 6 March 1780, Lafayette left for America. After the victory at the Siege of Yorktown, Lafayette returned to France. On 22 January 1782, he was received at Versailles. In 1783, Lafayette bought a townhouse, at 183 rue de Bourbon, for 200,000 livres ($2 million). He and Adrienne were active in their salon, at the Hôtel de La Fayette, the headquarters of Americans in Paris, such as Benjamin Franklin, John Adams, Abigail Adams, and Mr. and Mrs. John Jay who met every Monday, and dined in company with family, and the liberal nobility, such as Clermont-Tonnerre, Madame de Staël, Morellet, and Marmontel. Adrienne took a dislike to the pessimistic Gouverneur Morris, calling him an 'aristocrat'. Lafayette joined the French abolitionist group Society of the Friends of the Blacks (Société des amis des Noirs), which advocated the end of the slave trade and equal rights for free Blacks. In 1783, in correspondence with Washington, he urged the emancipation of slaves; and to establish them as farmer tenants. Although Washington demurred, Lafayette purchased land in the French colony of Cayenne to "experiment" with education, and emancipation, at his plantation La Belle Gabrielle. On 15 July 1789, he was acclaimed commander-in-chief of the National Guard (Garde nationale). His moderate (Constitutional Monarchist) views were rejected by the Royalists (Legitimists or Orléanist), and he became marginalized, with the rise of the Girondists, and then Jacobin radicals, and the increasing polarisation of politics. Adrienne went with Lafayette to Chavaniac, in October 1791, after he lost the mayoral election. After war was declared on Austria on 20 April 1792, Lafayette left for command of the army at Metz. After returning to Paris to defend the King, he was then accused of treason, and sought to escape to the Dutch Republic, but was arrested on 19 August by the Prussians at Rochefort, Belgium, and imprisoned at Wesel, and Magdeburg, Prussia. He was later transferred to the Austrians, and held at Olmutz. An escape attempt was unsuccessful. Monsieur: I believe you to be sincerely fanatic for liberty. It is a compliment I pay to very few people at this moment. I shall not examine whether that fanaticism, like religious fanaticism, does not generally defeat its own object, but I cannot persuade myself that one who has done so much for the emancipation of the negroes can be an agent of tyranny. I believe that if you are impassioned by the ends which your party seeks, at least you will abhor the means it employs. I am sure that you esteem, I might almost say that you respect, M. de Lafayette as a sincere and courageous friend of liberty, even when you persecute him because his opinions are different from your own as to the means of establishing freedom in France, and supported by courage like his and by faithful adherence to his oaths, are contrary to the party in which you have enlisted and to your new revolution. I believe all this, and therefore apply to you, although disdaining addressing all others; if I am mistaken tell me so, and I shall have troubled you for the last time. But if I am to be kept as a hostage, my captivity would be less hard to bear were I to choose Chavaniac as my prison on parole, and on the responsibility of the municipality of my village. If you wish to serve me, you will have the satisfaction of doing a good action by mitigating the fate of one who is unjustly persecuted and who, you well know, has neither the means nor the wish to injure. I consent to owe you that service. I am informed, Monsieur, that there is a movement afoot to imprison all former nobles, in connection with the treacherous behaviour of Dumouriez. I come now to tell you that though I declared my readiness at all times to stand surety for Monsieur de La Fayette, I most certainly have no intention of doing so for his enemies. Furthermore, whether I live or die is a matter of supreme indifference to Monsieur Dumouriez. You would do far better to leave me undisturbed in my retirement. When I was dragged from it, the only result was to awaken sympathy for me and to revive the memory of a great many injustices. I ask to be left with my children in the only situation I can find tolerable so long as my husband is a prisoner of the enemies of France. In May 1794, during the Reign of Terror, she was transferred to La Force Prison in Paris. Her grandmother, Catherine de Cossé-Brissac duchesse de Noailles, her mother, Henriette-Anne-Louise d'Aguesseau, duchesse d'Ayen, and sister, Anne Jeanne Baptiste Louise vicomtesse d'Ayen, were guillotined on 22 July 1794. She was transferred to the Collège du Plessis prison, then to a house on rue des Amandiers, then to the Desnos house, rue Notre-Dame des Champs. She was released on 22 January 1795, due to the efforts of Gouverneur Morris, James Monroe, and Elizabeth Monroe, who visited Adrienne in jail. In April 1795, Georges was sent to America, studied at Harvard, and stayed with George Washington. Gouverneur Morris advanced her 100,000 livres of his own money. On 1 September 1795, Monroe issued Adrienne American passports for her and the Lafayette family, (since they had been granted Citizenship), and she traveled to Lafayette's place of imprisonment. Adrienne travelled to Vienna where, on 10 October 1795, she met with the Emperor. She obtained permission to join her husband, "I grant it to you, but as for his liberty, that would be impossible – my hands are tied, it is a complicated affair". On 15 October 1795, she joined her husband, along with Anastasie, and Virginie, in the prison fortress of Olmütz. All of their money and baggage were confiscated. Their confinement became a cause célèbre. A play about them was written: The Prisoners of Olmütz, or Conjugal Devotion. John Parish, the United States consul in Hamburg, provided aid, but was unable to negotiate a release. (The United States did not have diplomatic relations with either Prussia or Austria). On 18 September 1797, the family was released, under the terms of the Treaty of Campo Formio (18 October 1797). They recuperated at Lehmkuhlen, Holstein near her sister Madame de Montagu, and aunt Madame de Tessé. At Mme de Tessé's Witmold, Anastasie married, Juste-Charles de la Tour-Maubourg, younger brother of another Olmütz detainee Charles César de Fay de La Tour-Maubourg, and Marie Victor de Fay, marquis de Latour-Maubourg. In 1798, Georges returned from America. Adrienne helped Mme de Montagu in her financial scheme to help the émigrés. In 1799, they moved to Vianen, near Utrecht. Lafayette remained exiled, but Adrienne returned to France. Adrienne was active recovering properties in France, including from her mother's estate, La Grange. 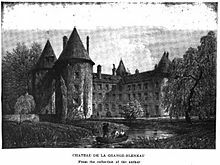 Her sister, Mme de Montagu, settled at Fontenay fr:Château de Fontenay. In 1799, with the fall of the Directory, she secured a passport for her husband's return to France. After Napoleon's plebiscite, on 1 March 1800, he restored Lafayette's citizenship, and removed his name from the émigrés list, along with the members of the Assemblée Nationale. Many of the returned exiles, and Charles James Fox came to visit at La Grange. They were about 200,000 livres in debt. Adrienne negotiated an indemnity for the seized Cayenne property. She recovered 500,000 francs in compensation of the confiscated Noailles property. She negotiated the sale of Brittany properties for 61,200 livres, and monthly rents of 4,800 livres. James Monroe brought Congress's grant of 11,500 acres (47 km2) in the Ohio territory, and secured a loan from Baring Brothers & Co to repay creditors, including Morris. In 1802, Georges de Lafayette married Emilie de Tracy, daughter of the Comte de Tracy. Georges entered the army, was wounded at the battle of Mincio, in 1800, and later was aide-de-camp to General Grouchy, and was with him at the Battle of Eylau, 1807, where he gave up his horse, after Grouchy's had been killed, at the risk of his own life. After that, he resigned his commission. On 20 April 1803, Virginie married Louis de Lasteyrie at La Grange. Their son, Jules de Lasteyrie (1810–1883) married Olivia de Rohan-Chabot (1813–1899), and lived at the château de la Grange-Bléneau for fifty-four years. Adrienne found out from a lacemaker, Mlle Paris, the burial place of her relatives and other victims of the Terror. She was active with Mme de Montagu in raising funds to build memorials at the Picpus Cemetery. She was chronically ill after her imprisonments, suffering from stomach pains, blisters, sores, and abscesses. A Dr. Sautereau stayed at La Grange, and Dr. Lobinhes was on call from Paris. In 1807, during a trip to the Auvergne region, Adrienne became ill; she was delirious but recovered enough on Christmas Eve to gather the family around her bed; her last words to Lafayette were: "Je suis toute à vous" ("I am all yours"). Given the purchase of saturne (lead), Burton concludes that lead poisoning was the cause of death. She was buried at the Picpus cemetery, after her death on 24 December 1807. There was also a refinement in the way she expressed herself, a loftiness of thought which astonished everyone. But what was admirable above all, was that tenderness of heart which she was constantly showing to her six children, to her sister, to her aunt, to M. de Tessé, she thought she was with them at Memphis, for by a miracle of feeling, her mind was never invariable fixed but where I was concerned. Georges de Lafayette married Emilie de Tracy, daughter of the Comte de Tracy, in 1802; they had three daughters and two sons: Natalie, who married Adolphe Perrier, Malthilde, who married Maurice de Pusy (1799–1864), (son of Jean-Xavier Bureau de Pusy), Clémentine, who married "Gustave" Auguste Bonnin de La Bonninière de Beaumont, Oscar Thomas Gilbert, marquis de La Fayette (1815–1881), liberal politician, and Edmond. Virginie married Louis de Lasteyrie on 20 April 1803.They had four children: Pauline, who married Charles de Rémusat, Mélanie, who married Francisque de Corcelle (a friend of de Tocqueville), in 1831, Octavie, and their son, Adrien Jules de Lasteyrie (1810–1883) married Olivia de Rohan-Chabot (1813–1899), the daughter of the émigré Louis de Rohan, Vicomte de Chabot, and Lady Charlotte Fitzgerald, daughter of the second Duke of Leinster. Mélanie and Francisque had a daughter Marie Henriette Hélène Marthe Tircuy de Corcelle (6 June 1832, Paris – 17 November 1902, Paris), who married Charles Adolphe Pineton de Chambrun (10 August 1831, Marjevols – 13 September 1891, New York), a lawyer from New York, at the Église de la Madeleine on 8 June 1859. Adrien Jules and Olivia had a son, Louis de Lasteyrie who married Olivia Mills Goodlake; they had two children, Gui de Lasteyrie (born 1878), and Louis de Lasteyrie (1881–1955). Louis married Louise Chodron Courcel, in 1908. Anastasie de Lafayette married Juste-Charles de Fay de La Tour-Maubourg (Motte-Galaure, Drôme 8 June 1744, 28 May 1824); they had two children: Célestine Louise Henriette de Fay de La Tour-Maubourg (1799 – 16 July 1893), and Jenny de Fay de La Tour-Maubourg (6 September 1812 – 15 April 1897). His father was Claude Florimond de Faÿ (1712–1790), and his mother was Marie Françoise Vacheron Bermont (born 1712). His brother, Marie Victor de Fay, marquis de Latour-Maubourg, was a Cavalry Corps commander, survived the Russian Campaign and was wounded at the battle of Leipzig. His other brother, Charles César de Fay de La Tour-Maubourg was a prisoner at Olmutz. Their descendants include: Queen Donna Paola Ruffo di Calabria (11 September 1937), who married HRH Prince Albert, Prince of Liège, in Brussels, Belgium, on 2 July 1959, later King Albert II of Belgium. ^ Guilhou 1918, p. 11. ^ Unger 2002, p. 22. ^ Nelson 2005, p. 55. ^ Unger 2002, p. 24. ^ Maurois 1961, p. 66. ^ Unger 2002, p. 110. ^ Unger 2002, p. 169. ^ Maurois 1961, p. 113. ^ Miller, Envoy, p. 18. ^ a b Kaminsky 2005, pp. 34–35. ^ "La Belle Gabrielle, Lafayette and Slavery, Lafayette College". Archived from the original on 30 August 2009. Retrieved 18 March 2009. ^ Unger 2002, p. 216. ^ Lamb & Pond 1881, pp. 353–376. ^ Baker 1977, pp. 1–4. ^ Crawford 1907, pp. 165–166. ^ Maurois 1961, p. 235. ^ Griffith 1898, p. 393. ^ The Collège du Plessis, where her husband had been educated, was turned into a prison during the Reign of Terror. ^ Morris & Morris 1888b, p. 64. ^ Roberts 2008, p. 327. ^ Miller, Envoy, p. 211. ^ Unger 2002, p. 308. ^ Crawford 1908, p. 308. ^ Unger 2002, p. 309. ^ "The Prisoner of Olmütz". sites.lafayette.edu. Retrieved 14 November 2017. ^ Sichel 1900, p. 260. ^ a b Unger 2002, p. 329. ^ Unger 2002, p. 332. ^ Unger 2002, p. 334. ^ Crawford 1907, p. 304. ^ Chisholm 1911, pp. 65–67. ^ Grouchy, Emmanuel de. "Grouchy correspondence with his wife". Archived from the original on 19 July 2011. .
^ a b Crawford 1907, p. 307. ^ Crawford 1907, p. 309. ^ Crawford 1907, p. 318. ^ Destremau, Noëlle (1996). "Adrienne De Lafayette: L'héroism de l'amour conjugal" (PDF). noelle.destremau.free.fr/. ^ Burton 2001, p. 13. ^ i Crawford 1907, p. 319. ^ Cloquet 1835, p. 227. ^ Alexis de Tocqueville 1805 2005. ^ Senior 1880, p. 21. ^ Chaffanjon 1976, p. [page needed]. ^ Lundy, Darryl (10 May 2003). "Olivia de Rohan-Chabot". thePeerage.com. p. 5830 § 58297. [unreliable source]. Baker, James Wesley (1977). "The Imprisonment of Lafayette". American Heritage. 28 (4): 1–4. Burton, June K. (26 January 2001). "Two "Better Halves" in the Worst of Times – Adrienne Noailles Lafayette (1759–1807) and Fanny Burney d'Arblay (1752–1840) as Medical and Surgical Patients under the First Empire" (PDF). Chaffanjon, Arnaud (1976). La Fayette et sa descendance. Berger Levraud. Chisholm, Hugh, ed. (1911). "La Fayette, Marie Joseph Paul Yves Roch Gilbert du Motier, Marquis de" . Encyclopædia Britannica. 16 (11th ed.). Cambridge University Press. pp. 65–67. Cloquet, Jules Hippolite (1835). Recollections of the Private Life of General Lafayette: Embellished with Numerous Engravings as in the Original Paris Edition. Baldwin. p. 227. Crawford, Mary MacDermot (1907). Madame de Lafayette and Her Family. J. Pot & Company. pp. 11, 165–166. Crawford, Mary MacDermot (1908). The Wife of Lafayette. E. Nash. p. 297. Griffith, Thomas Waters (1898). Latimer, Elizabeth Wormeley (ed.). My Scrap-book of the French Revolution. A. C. McClurg. p. 393. Guilhou, Marquerite (1918). 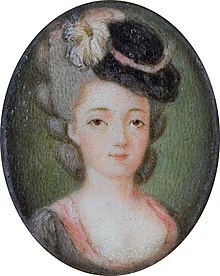 Life of Adrienne D'Ayen: Marquise de La Fayette. R. F. Seymour. Kaminsky, John (2005). A Necessary Evil? : Slavery and the Debate of the Constitution. Rowman & Littlefield. ISBN 0-945612-33-8. Lamb, Martha; Pond, Nathan Gillett (1881). Stevens, John Austin; DeCosta, Benjamin Franklin; Johnston, Henry Phelps (eds.). The Magazine of American History with Notes and Queries. A. S. Barnes. p. 353–357. Morris, Gouverneur; Morris, Anne Cary (1888b). The Diary and Letters of Gouverneur Morris. II. C. Scribner's Sons. Nelson, Paul David (2005). Francis Rawdon-Hastings, Marquess of Hastings: Soldier, Peer of the Realm, Governor-General of India. Fairleigh Dickinson University Press. p. 55. ISBN 978-0-8386-4071-5. Roberts, Cokie (2008). Ladies of Liberty. William Morrow. p. 327. ISBN 978-0-06-078234-4. Senior, Nassau William (1880). Conversations with Distinguished Persons During the Second Empire. p. 21. Sichel, Edith Helen (1900). The Household of the Lafayettes. A. Constable. p. 71. "Portraits / His friends: Francisque de Corcelle". Alexis de Tocqueville 1805. 15 October 2005. Retrieved 27 December 2016. Unger, Harlow Giles (2002). Lafayette. John Wiley & Sons. ISBN 0-471-39432-7. Gottschlk, Louis (2007). Lafayette Comes to America. Read Books. pp. 27. ISBN 978-1-4067-2793-7. Lane, Jason (2003). General and Madame de Lafayette: Partners in Liberty's Cause in the American and French Revolutions. Taylor Trade Publishing. Maurois, André (1961). Adrienne; ou, La vie de Madame de La Fayette. Hachette. Morris, Gouverneur; Morris, Anne Cary (1888). The Diary and Letters of Gouverneur Morris. I. C. Scribner's Sons. "Books: An 18th Century Marriage". Time. 26 May 1961.